High resolution multi-spectral and panchromatic satellite images were obtained from Digital Globe http://www.digitalglobe.com. The images were obtained in two batches, under delivery orders 052896239040_01 (inclusive of Product 01 and 02) and 052927222010_01 (Product 01) (Appendix 1 & 2). In this report, these images are conveniently referred to its geographical area based on prominent features. Hence, the western portion is coded as TubauImage (named after Tubau Bazaar), whereas the eastern portion is coded as JelalongImage (named after Jelalong River) (Figure 1). TubauImage was captured between 5 to 13 August 2012 and JelalongImage on 5 August 2012. 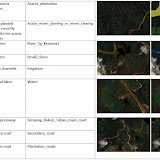 Multi-spectral and panchromatic raster datasets, with cell sizes of 2 metres and 0.5 metres respectively were obtained. 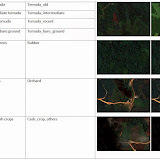 Analyses were carried out in software ArcGIS 10.1 developed by Environmental Systems Research Institute, Inc. (Esri©). 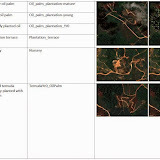 Data frame properties follow that of raster datasets from DigiGlobe, which were projected based on the WGS_84_UTM_zone_49N ) (Transverse_Mercator) coordinate system. Multispectral raster dataset was pan-sharped with panchromatic raster dataset to create red-green-blue (RGB) raster with the resolution of the panchromatic raster. The raster data was first analysed using the Normalized Difference Vegetation Index (NDVI) to segregate vegetated and non-vegetated areas. Expert interpretation based on visual analyses and ability to discern vegetation types were carried out to delineate the boundaries and categorize the different class of vegetated areas. 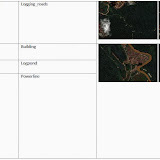 For detailed classification, see section on Classification of land use. 10．Grass and shrubs – grassy areas or shrubs created by construction of roads, powerline, settlements etc. Of the two raster dataset, 96.84% of the area was successfully classified. The remaining 3.16% was covered in cloud, and therefore, could not be mapped correctly. Forested area represented the most of the area, amounting to 55.33% of the project area. Of this, good standing forests accounted for 2.59%, whereas the remaining 52.74% of the forest category was classified as degraded forests or forest clearings. The second highest coverage category was temuda, which represented 21.85% of the project area. Out of this, old temuda represented 17.53% of the project area, the largest of the temuda category. This was followed by intermediate and recently opened temuda. A collective figure of 3.67% for intermediate and recently created temuda was reported because of the high probability of overlapping in land use category between these two. Recently cleared forests, adjacent to temuda was more likely a temuda itself, and was therefore classified as “temuda bare ground”, which represented 0.65% of the project area. Within the temuda category, recently created temuda i.e. less than 2 years old, represented about 3.99%, meaning to say that biannually, local people used very little land for swidden agriculture purposes. If converted to area, this accounted for 528.10 hectares or 0.85% of the project area. On top of that, another 0.11% of temuda within the project was converted and planted with oil palm, but this figure could be under reported because a large portion of young oil palm planted areas could have been converted from temuda as well. 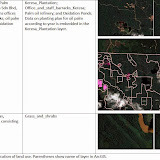 Oil palm plated area accounted for 15.92% of the project area, the third largest major land use type. Within this category, matured oil palms covered 9.12% or 5,666 hectares of the project area, followed by young oil palms which covered 6.36% or 3,954 hectares of the project area. About 0.32% of the project area was classified as plantation terrace, more likely to be planted with oil palm. Some overlaps of land use with temuda area that were planted with oil palm was also observed, and it cannot be confidently determined where the exact boundaries between recently converted temuda for oil palm or expanded oil palm plantation. The boundaries between some of the larger oil palm plantations operated by companies and smallholders plantation were not evident, and this could have also resulted in some overlaps of land use classification. Although the project area falls inside the Sarawak Planted Forest project area, a large proportion of the area have not been converted into acacia plantation. Area classifies as planted or worked on for acacia plantation covered only 1.35% of the project area. 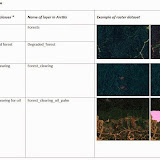 This entry was posted in Report of Research, 未分類 @en and tagged acacia plantation, ArcGIS @en, Center for Southeast Asia Studies, Jason Hon, Keresa plantation, oil palm, oil palm plantation, Sarawak @en, temuda @en. Bookmark the permalink.